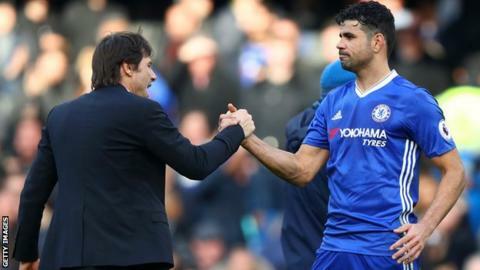 Details of the message sent by Chelsea manager Antonio Conte that caused striker Diego Costa to announce he was not wanted by the club have been revealed. Costa, 28, said on Wednesday that he had learned he was no longer part of the Premier League champions' plans. The Italian manager had sent a text to his players wishing them a good holiday and telling them to stay fit and, after Costa replied in a jokey way, the 28-year-old was told he was no longer in the manager's plans. The Spain international then showed the exchange to fellow players. Costa scored 20 goals in 35 Premier League games to help the Blues win the title but now appears not to have a future at Stamford Bridge. "My relationship with the coach has been bad this season," said Costa. He added after Spain's 2-2 draw with Colombia: "It is a shame, I have already forwarded the message to Chelsea people to decide." Conte texts players wishing them a good holiday and telling them to stay fit. Costa sends a jokey reply back. Conte responds by saying: "Hi Diego, I hope you are well. Thanks for the season we spent together. Good luck for the next year but you are not in my plan." Costa shows exchange to fellow players. AS Sport first reported the contents of Conte's message to Costa, but the BBC has confirmed its accuracy. BBC Sport also understands the disagreement between player and manager has not angered those in the boardroom at the club, such as director Marina Granovskaia. However, it is likely to have wiped millions off Costa's asking price. Brazil-born Costa joined Chelsea from Atletico Madrid for a reported £32m in 2014. He spent four seasons at Atleti and suggested he might be open to a return, despite the La Liga club being banned from signing players until the January transfer window. "Being five months without playing? I do not know, it's complicated, but people know that I love Atletico a lot and that I love to live in Madrid," Costa said. "It would be nice to go back, but it's difficult to be four or five months without playing. It's a World Cup year and there are many things to think about. I need to play, just that." Later in January, Tianjin Quanjian's owner said a bid to sign Costa had been scuppered by new rules over foreign players in the Chinese Super League.